Since all of the solutions make assumptions (like this one assuming the light will not be turned on/off by the warden) I will take that route as well. Divide the room into a 10×10 cell. The first day, the prisoner puts it in the bottom left corner, cell 0-0. 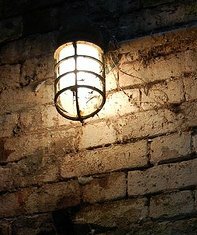 Each time a prisoner is in the room for the first time, he moves the lamp 1/10th along the path to the opposite wall, or back to the front wall and further to the right to start the next set of 10. Once a prisoner moves it to the top right corner, cell 10×10, he knows all prisoners have been there, and it will be the earliest possible time to answer yes. At the beginning, the prisoners select a leader. Whenever a person (with the exception of the leader) comes into a room, he turns the lights on (but he does this only once). If the lights are already on, he does nothing. When the leader goes into the room, he turns off the lights. When he will have turned off the lights 99 times, he is 100% sure that everyone has been in the room. First person smashes the bulb, selects 99 pieces (counting very carefully), stashes them in a corner. Each person removes a piece on their first visit. Hey, (i am not a native english speaker so please oversee my mistakes) the Problem inspired me and my friend, so we thought a while about it, and we descided its better to find a solution wich is not a 100% sure, but much more quicker. Because if u wait untill the one Leader was 100 Times in the room it is likely (if they are been pickt absolutely random) that all the onter persons also have been 100 times in the room wich brings us to a total of 100×100 = 10.000 Days on average to solve the Problem, but this is around 30 Years wich is a little bit much. So we tried to just count 25 prisoners who have been in the room at least 4 times. (we let ouer computer do that 10.000.000 Times; neded about 2h) and we had an average of about 3000 days to acomplish and in about 98,35% of the tries the Leader was right. BUT, in 1,65% of all tries the Prisoners died. So we improoved, and came up with counting only 7 prisoners who have been at least 7 times in the room. (and again we did that 10.000.000 times) and with this we had more than 99.98% the right awnser and it only took about 2300 days.